Pain is a type of distress. It’s a natural part of life. Pain is designed to be temporary. The purpose of pain is to PUSH US TO DO SOMETHING to end the pain…so we can return to a pain-free state. Pain is a call to action. Alike most things in life, we have two choices when it comes to pain. We can either LEAN INTO the painful situation and change things or we can work hard to avoid dealing with it. If all we do is work to avoid pain…if we don’t Lean Into it…if we don’t deal with it…if we refuse to accept it…if we refuse to do what’s needed to get through it …OUR PAIN WON’T GO AWAY. It’ll be with us for a long time. Running from our problems just prolongs our agony and brings us to a chronic state of suffering… a long-term condition of being overwhelmed with despair and stuck in the same place and time… and we don’t move forward. We want things to get better in our life, but we’re NOT WILLING to do the things that will make our life better. We want life to change, but we’re not in the mood to change. We generally DON’T CHOOSE to make major life changes “out of the blue” or on our own. Change usually happens when we’re FORCED to make changes. And most often, we make changes when we have NO OTHER CHOICE but to change. We generally let things get SO BAD that the pain of living like we’re living is MUCH GREATER than the pain of change…and that’s when we begin to change. And stagnate in our pain and suffering. And the wisdom to know our limits. Acceptance of our life situation and what we need to do about it…is a way of turning suffering we cannot tolerate into pain we can tolerate. It’s a way of turning hopelessness into hope. Most of us have been suffering the pain of our lifestyle and choices for years…and somehow, we remain willing to experience ongoing pain and misery because of them. We’re somehow willing to suffer long-term pain, but we’re not willing to go through the temporary pain of change. We’re somehow willing to dwell in a painful past, to remain in painful situations, and to continue painful addictions and impulsive behavior. We do so because we’re unwilling to accept and undergo the changes that will bring peace and stability. Radical Acceptance involves accepting what we’d normally consider unacceptable. When we LIVE BY Radical Acceptance, we CAN ACCEPT something whether or not we approve of it and whether or not it’s right or wrong, fair or unfair, or pleasant or unpleasant. Radical Acceptance is about CHOOSING TO ACCEPT whatever is in our best interests to accept. We MUST ACCEPT whatever we HAVE TO accept because NON-ACCEPTANCE keeps us emotionally troubled and stuck in negativity. To have peace, we must accept many things whether or not they’re acceptable. We must accept things from the past and present. Anything in the past that’s unfixable, we need to LET IT GO. Anything in our current life that we CANNOT CHANGE, we need to accept that it MAY NOT change. Anything we CAN change, we must LEAN INTO…to MAKE THE CHANGES we CAN MAKE. Our Recovery Goal is to live a life that MAXIMIZES peace, stability, meaning, and productivity. To do that, we MUST ACCEPT what has happened HAS HAPPENED, what we’ve done, WE’VE DONE…then, we need to LET IT GO…so we can GO ON with life. Welcome to DBT-CBT! This is an exciting time! You’re about to embark on a journey that CAN change your life! The original DBT program developed by Marsha M. Linehan, Ph.D. was designed to treat some of the MOST DIFFICULT to treat individuals…and the results have been ASTOUNDING! 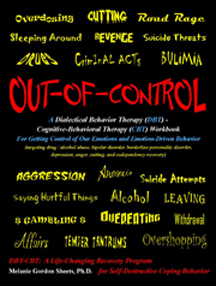 This program, DBT-CBT, is based on Dr. Linehan’s work, but it has been GREATLY modified! It includes many original concepts, principles, and techniques developed during 24 years of patient care. MANY PEOPLE have described DBT-CBT to be LIFE-CHANGING, so HAVE GREAT HOPE! Applying the principles of DBT-CBT to your life CAN BE LIFE-CHANGING…but only if you’re WILLING TO MAKE CHANGES in your life. I assume you have great interest in changing your life…in feeling better, in responding to the world better, and having better life outcomes and experiences… else, you wouldn’t be reading this book…especially an Intro!! You’ve already taken the first step on this journey…and the Road to Recovery! WELCOME ABOARD! This workbook is written for people who are hurting and suffering the pain of life. It’s about bringing hope and peace and the life-changing gift of healing and recovery. I hope you heal and recover. I hope this workbook leads you there. Even if it’s just about “planting seeds” or watering the seeds of recovery that were planted before, then, IT IS GOOD. This workbook CAN BE life-changing…AND HOW I HOPE…it is YOUR LIFE that is changed! Think about this…if we do not make positive changes in our life, our life will NOT change for the positive. Please remember this. Repeat it over and over…”IF I DO NOT MAKE POSITIVE CHANGES IN MY LIFE…MY LIFE WILL NOT CHANGE FOR THE POSITIVE.” Let that penetrate your soul. Making major life changes is hard to do, BUT with effort, support, and the grace of God, MANY people RECOVER! We all know these people or we’ve heard their stories. They’re RECOVERED drug addicts, alcoholics, career criminals, “treatment failures,” and “hopeless cases.” They’re people with long histories of depression, anger, anxiety, suicide attempts, self-mutilation, abusive relationships, aggression, eating disorders, Bipolar Disorder, codependency, Borderline Personality Disorder, and other major life issues. Something Happened and they became disgusted enough or slowed down long enough to Think Things Through. They set their heart, mind, soul, and spirit on recovery…and THEY RECOVERED. Think about people you know who have recovered…or recovery stories you’ve heard. How did they do it? What changes did they make in their life? …to make major life changes…including changes in how we think and respond to life…our life in the past, the present, and the future. …to turn away from old ways and respond to life in new ways. …to use Life-Enhancing Coping Skills to deal with tough and trying times rather than our preferred Self-Destructive Coping Behaviors. …to make changes in what we allow in our life and what we allow ourselves to be involved in. …to remove toxic people and situations from our life…and add life-enhancing, recovery-supporting people and situations. …to fill our life with meaningful activities and relationships…things that give life meaning and value. …to have hope and faith that things will get better as we get better. …to accept that life isn’t easy or always enjoyable. …to accept and deal with the difficult things that Come Our Way. …to give ourselves time to grow into and be…more and more the person we were designed to be. People who recover make many changes in their life. They realize recovery is a process…a lifestyle…and NOT a one-time event! Recovery requires work. It’s work worth doing…because we’re worth the work and the people who love us and depend on us are worth our work and sacrifices! Recovery requires dedication and perseverance to live, eat, and breathe the principles, concepts, and skills for living a Recovery Lifestyle. This workbook also requires dedication and perseverance to work through. It’ll teach many principles, concepts, and skills for living a Recovery Lifestyle. It’s important to accept we’re human…and because of our humanity, we’ve made many errors and bad decisions. Most of us have done some pretty stupid and shameful things…and many self-defeating things over and over! We’re human and we have a record of our life to prove it! If you find yourself wearing these shoes, realize you’re not the trailblazer. Many have come before you…and many are walking the same path right now. You might say, “Yeah, some more than others!”…and you’re right! We’re a product of our past experiences and the environments we were raised in. It’s RARE that a kid with a stable home environment, emotionally healthy parents, positive role models, and good self-esteem begins to live a troubled life. Something generally happened that led the kid off course. RARELY do kids with “good enough upbringings” just “go bad.” This isn’t meant to minimize OUR RESPONSIBILITY for our behavior and choices, but it’s important to understand “why we are the way we are” is because Something Happened in our life, be it one very difficult situation or many. This workbook will help us develop skills to manage our life in the here-and-now. We’ll learn skills to cope effectively with our problems, to set boundaries to prevent and minimize emotional distress and problems, to gain peace and acceptance, and to make lifestyle changes which will gradually lead to relief, peace, then satisfaction, and finally, joy. Some people recover on the first try; however, recovery usually takes many attempts over many years. Some days may be easy…and some more difficult. Recovery hinges on minute-to-minute and hour-to-hour decisions to remain on the Recovery Path. We can help ourselves along the way by seeking people who will support and encourage us along the path of recovery…AND BY AVOIDING people who are critical or negative BECAUSE THESE PEOPLE ARE TOXIC TO OUR RECOVERY. That’s a difficult question. Honestly reflect on it a minute. What are you WILLING to give up or change in order for your life to change? No doubt you have some things in mind…and heart…that YOU KNOW MUST CHANGE…in order for YOUR LIFE to CHANGE and your LIFE SITUATIONS to IMPROVE. There are many things we need to give up and change. These are often things we have NO DESIRE to give up or change. That’s where we run into problems. We have the gut wisdom TO KNOW what these things are…they’re just hard to look at and deal with! What do you NEED TO CHANGE? This question will come up many times during this study. The answer you write today may be very different from your answer later. That’s because this study will help you gain insight and learn more about the things that mess up our lives and keep our lives messed up. Take a few moments and reflect on your thoughts and feelings about this opening reading. Does it make you excited? Uneasy? Anxious? Does it bring a sense of hope and peace…and light at the end of the tunnel…or does it bring a sense of dread…or some of both?